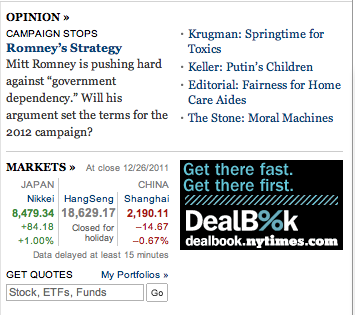 Mitt Romney is pushing hard against “government dependency.” Will his argument set the terms for the 2012 campaign? Complaint is first step [whump] It’s about what you want to do that who won’t let you do. WMR, you need to explain how dependency upon Gov. by whom prevents YOU from bering blew to do what YOU want to do. Once we thought ‘entitlement’ meant that Americans were entitled to the privilege of trying to succeed in the greatest country in the world. Americans fought and died to earn and protect that entitlement. But today the new entitlement battle is over the size of the check you get from Washington. It still reads like a COMPLAINT, and not one in which YOU have standing, and perhaps GROUNDS for a complaint, but who [rhrnrhrn mRn] tries to start, S.T.A.R.T! with a REQUESTED REMEDY, WMR. …the REQUESTED REMEDY is “What do you want who to do so you CAN do what who will not let you do?” In this case the government dependency vote getting machine. It’s traditional politics. You’re doing a great, “classic” job, but is that enough in 2011? With 30 million [”’thn] Only 30 million, generations left to go until who must be at a new prayer spot outside the red nova blast zone of our celestial campfire, sol, our sun, WMR. Political theater at it’s best. But with the internet reading and writing, and streaming away – is that going to cut it any more? Vote for the Norman Rockwell Image. He looks cool? 3. Still need to find the still photo of Imam’s vestibule like an open grave with brother Sayyid half way below ground level – by the way – another good security measure. ANY muslim Imam faces on qibla during prayers. But then during Juma Speech who is up on the speakers platform, exactly as you are in the photo, WMR. The question is does the audience EVER have a face to back relationship with our US leaders? Is that why the divide and conquer with bare one vote majority hypnotists are controlling our nation? The closest we get to that is to dim the lights and all look at some audio-visual material together, and even then the ‘leader’ faces the ‘audience’ in the dark. xref: [thnk/] Barbara Fritche’s younger sister who dropped the umbrella in 2000 and instantly who ended whose speech. 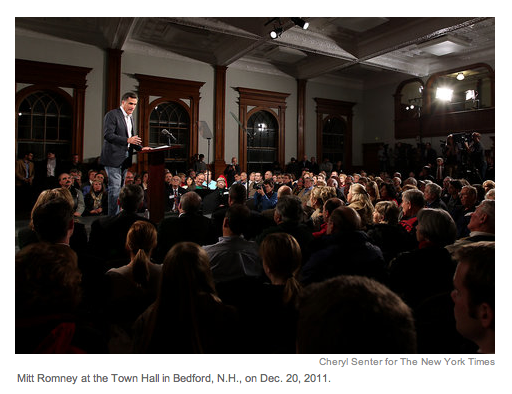 Mitt Romney at the Town Hall in Bedford, N.H., on Dec. 20, 2011. Romney and his aides have designed his rhetoric to define pretty much all spending on entitlements, including provisions for the injured, unemployed, sick, disabled or elderly as benefits to the poor who, Romney implies, are undeserving. And it doesn’t matter whether the money to pay for these programs comes from employer and employee contributions and not just tax revenue — they are all under suspicion. Will the United States be an Entitlement Society or an Opportunity Society? In an Entitlement Society, government provides every citizen the same or similar rewards, regardless of education, effort and willingness to innovate, pioneer or take risk. In an Opportunity Society, free people living under a limited government choose whether or not to pursue education, engage in hard work, and pursue the passion of their ideas and dreams. If they succeed, they merit the rewards they are able to enjoy. Without the underlying belief many voters hold that programs serving low-income beneficiaries perpetuate poverty and discourage work, Romney could not have banked on voter support for his answer in this exchange between the candidate and Chris Wallace on FOX News Sunday the week before Christmas. In the same way by cutting welfare spending dramatically, I don’t think we hurt the poor. In the same way I think we cut Medicaid spending by having it go to the states, run more efficiently with less fraud, I don’t think we’ll hurt the people that depend on the program for their health care. In attacking the “entitlement society,” Romney is not breaking new ground; he is following in the path of conservative talk show hosts and Tea Party leaders who think social insurance spending is destroying America. So, what you have to do is keep faith with the people that are already in the system, that don’t have any other options, we have to keep faith with them. But basically what we have to do is wean everybody else off. And wean everybody off because we have to take those unfunded net liabilities off our bank sheet. The campaign strategy adopted by Romney attempts to mitigate one of the problems facing Republicans pressing for major domestic spending cuts: the American public is highly conflicted on the subject of providing aid to people in need. While strongly opposed to “welfare,” decisive majorities support more spending in key public policy areas. Polls conducted since 1972 by the General Social Survey show that by margins of two to one, voters consistently say too little is spent on the poor, on education, on health care, on drug treatment — the list is long. The word entitlement “implies that those receiving government aid have a sense of entitlement, that they’re getting something for nothing,” as Bill Boyarsky, a lecturer at the University of Southern California’s Annenberg School for Communication, points out. The 2-to-1 level of support found for spending on the poor for health care and other social services disappears when voters are asked specifically about welfare, according to the General Social Survey; when that word is used, voters by a better than 2-to-1 margin, 49.3 percent to 21 percent, say that “too much” is spent. In other words, a politician can either use the phrase “spending to help the poor” or the words “welfare” and “entitlement” to describe the government programs to alleviate hardship and therefore produce antithetical reactions in the public. The issue of race is ever-present. Hostility to welfare is driven by whites, 52.6 percent of whom say “too much” is spent on welfare programs, three times the 16.6 percent who say it’s “too little.” 43.2 percent of blacks say too little, and 27.3 percent say too much. 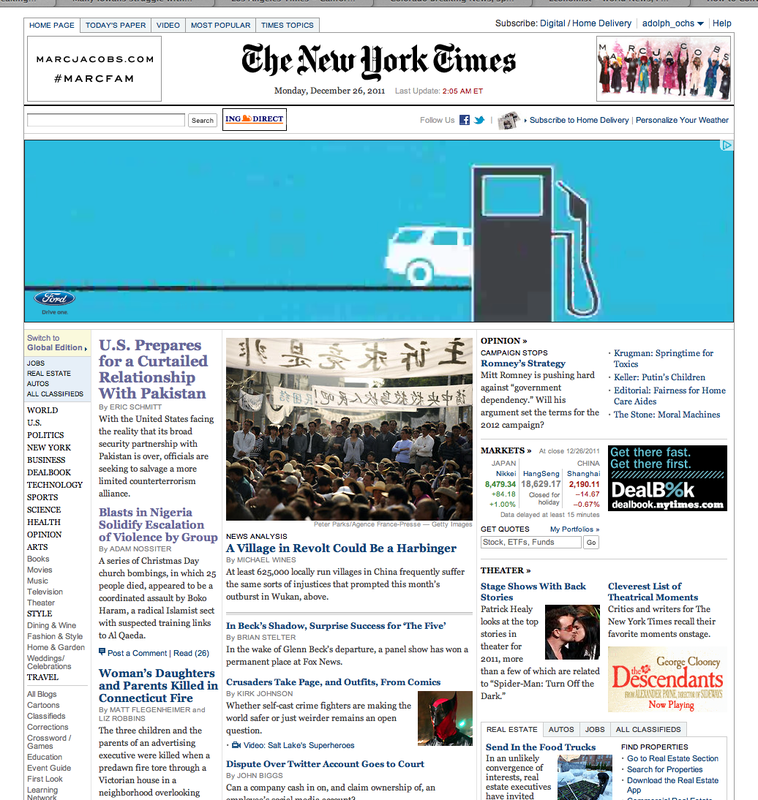 Both blacks and whites are highly critical of the effects of welfare, with strong majorities of both races agreeing that the program encourages “people to work less” — 73.7 percent in the case of whites, 74.1 percent in the case of blacks, according to cumulative answers to the General Social Survey’s polling from 1972 to 2010. So, who needs to build the the most spacious indoor / outdoor combination [[thnk/]] entertainment venue, green belt, recreation and cultural center in the world and get who all participating, because by 2012 shouldn’t work be ‘fun’ by now? With all the technology at hand? U.S. Citizens working to lead Global Public’s marching [whump] heart’s [tn] club band? Anyone can complain, and that’s all this article is about. We need leadership, alternatives […] choices, carrots of job descriptions with checks and balances who all step up to the promotions instead of laughing at who expects whom to chain [rhnrhnrhn] themselves to privative technology mainly to prove whose willingness to serve whom in what Pyramid rather than to produce anything of real value. Is that right? Romney’s goal is to persuade swing voters of the imminent moral and material danger that Obama and the Democratic party pose. Here are three more lines from the Romney op-ed. Over the past three years, Barack Obama has been replacing our merit-based society with an Entitlement Society. If we continue on this course for another four years, we may pass the point of no return. We will have created a society that contains a sizable contingent of long-term jobless, dependent on government benefits for survival. Government dependency can only foster passivity and sloth. This is not the Republicanism of compassionate conservatism, far from it. In recent weeks, the former Massachusetts Governor has laid down a set of markers planting himself firmly on the right – just as Obama has begun to stake out a more leftward position. In outline, we are seeing the beginning of the general election campaign. Romney’s adoption of an anti-entitlement strategy comes at a time when he appears to be looking up from the primaries toward Election Day, which suggests that his hard-line stance will be central to his campaign against Obama and not just a temporary maneuver. We are headed toward an ideological confrontation over the next 11 months of an intensity rarely seen in American political history.